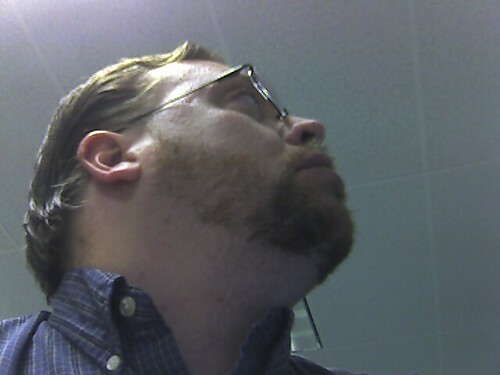 How Not To Grow A Beard: Day 26 | Kris Johnson's Blog…sort of. This series of photos, when arranged in the proper order, will undoubtedly chronicle my descent into madness as the beard—malevolent, sentient and hungry for power—grows not outward but inward, the roots of each follicle making their way inexorably toward strategic areas of my brain, intent on wresting control of my cognitive and motor functions from the hippocampus, the seat of my personality. Even now, I can feel the vile tendrils burrowing through flesh and bone; at the edge of my conscious the susurrant song of the beard is constant and nerve-wracking. When all is quiet around me, it whispers to me, describing the foul crimes it will commit with my body. In just a few more days, I’ll be able to shave. I hope it isn’t too late. It’s only funny if it’s not happening to you. I succumbed and shaved last week. My wife wouldn’t kiss me otherwise. She is the boss, after all. Wow. Our first HoNoToGroABeMo casualty. You fought the good fight, P.G. No one can ever take that away from you. It was my longest stretch ever without shaving, so that’s something… except for during that experimentation phase in college, but we don’t count that… right?